In this entry I’m going to talk a little bit about the kids stuff. Just to warn you, this isn’t all chronological and stuff. In true MYWTM fashion, it will be disorganized and random. 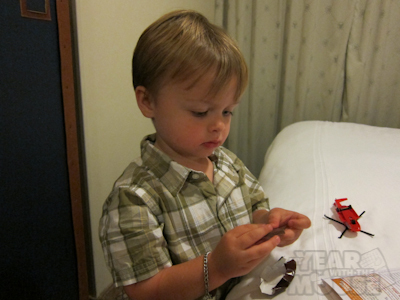 There are a few things that make a WORLD of difference between Disney and other cruises when it comes to kids, and I’m not just talking about the kid’s programming (which looked very awesome but Theo was ever-so-slightly too young for it). But first I’m going to toss in another picture. Yep, a small but handy bath tub for all of your kid-bathing needs. Theo is still at that age where showers are kind of scary and he’d prefer not to take them, so the bath tub was awesome. And the tub/shower is in a separate little room from the toilet as well. It’s these little kinds of details that make a huge difference when you’re actually onboard and needing these amenities. Eating is fabulous. 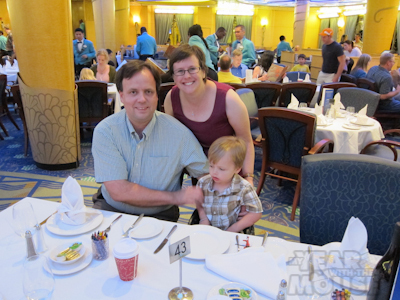 Like all cruises, you are assigned a “seating” time for dinner–we were in second seating so our dinner was at 8:15. That’s pretty late for a lot of people, but for a family of night owls like ours, it was perfect. Kid’s meals are served instantly! I know, this is something that non-parents don’t even think about, or at least I didn’t think about until I became a parent, but it’s SO hard for a little one to sit down, order, and then have to wait for everyone else’s food to be ready and brought out at the same time. The kids had kid’s menus of course, from which you could order whatever you like–standard fare of mac and cheese, mini burger, pizza, chicken strips, etc. plus some “chef’s choice” closer to the adult menu of the evening. The kids menus were for coloring, and they cleverly used washable crayons so coloring on the nice white tablecloths was no problem. But back to the food–so you would order for the kids and within just a few minutes the kid’s plate would appear–one of those nice partitioned plates too, so foods don’t mix. 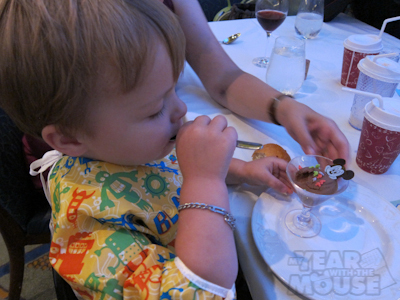 The adult food was served in a more leisurely manner, but it was really helpful to have Theo get started and not have to wait for us. Plus, dessert! 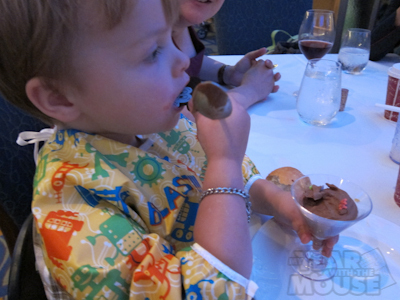 Chocolate pudding--Theo is a fan. I forgot to add up there that there are actually 3 different restaurants (plus one adult-only restaurant), and you rotate between the three of them. You actually keep your same server with you the whole time, so that was really nice. We did a couple of things that really helped Theo with the sit-down dinners, which can be a challenge for a busy boy like ours who so rarely sits still. 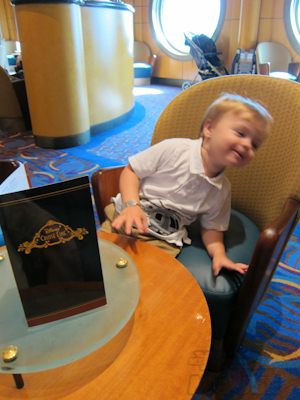 First, we strapped him into a high chair. I know many kids his age are out of the high chairs but believe me, when he’s not in a chair we spend the entire meal getting him to sit down. Second, we used bribery–that is, Theo is really into toy cars, so we got a 10-pack of Matchbox cars and every night, right before dinner, he got a brand-new car. The novelty of a new toy really held his attention and he loved showing each new car to our server, Goran. The third thing I was so glad we did was bringing sleeved bibs. The ones we got, made by Bumkins, are really the best–great coverage and really waterproof. I also love that they tie in the back instead of velcro. For us there’s no choking danger with the tie and it’s a bit harder for Theo to rip off on his own. I did dress Theo up a bit for each dinner and it was so nice to have maximum coverage to give his clothes a fighting chance to get clean again. Speaking of which, my new favorite travel item is the Oxi Clean Max Force Pre-Treater Gel Stick. It’s in a bottle and is, obviously, a stain stick. The nice thing is that you can apply it when the stain is fresh and then wait up to a week to launder. When we travel, I bring this bad boy along and whenever we get a stain I rub it in and then toss the item with the rest of the dirty laundry and it works SO well once we get home instead of trying to treat week-old stains at home. The only thing it doesn’t really work very well on is grease stains, for which you need blue Dawn once you get home. But other than that–LOVE. Anywho, even chocolate pudding is no match for that stuff. Was I talking about kid amenities? Can’t remember. Anyway, another nice thing is the Wave Phones in each room. They are basically onboard cell phones and there are two of them. You can send one off with the kids and keep one for yourself and stay in touch whenever you’re separated. It’s very cool and I would imagine extremely handy for families with older kids, though we did use it when we had Theo in Flounder’s Reef Nursery. Another fun thing about the Disney cruise is that the cabin doors are metal. I know, doesn’t sound like fun, but…you can decorate your door with magnets!! There were a lot of really cute door decorations we saw. 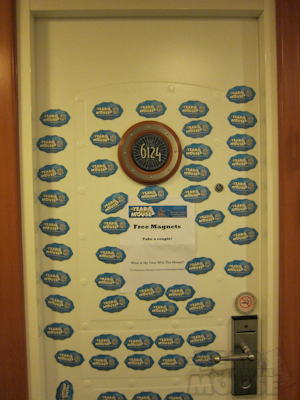 I also had some MYWTM magnets made up and stuck them all over the door with a sign inviting people to take a couple. I thought it would be a fun way to publicize the blog a bit as well as giving people a chance to dress up their doors a little. They seemed to be pretty popular, given that I went on the trip with 100 of them and returned with ~15. Very fun! And if you made your way here via a magnet–welcome! I hope you enjoyed the cruise as much as we did! 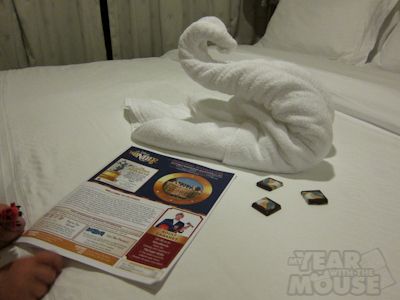 The towels were really awesome–a new one every night and so much fun! 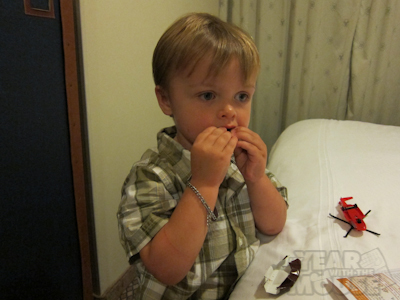 Theo had to immediately try out the chocolates. Notice the lack of stains on his shirt! I had also read that you can order milk and cookies from room service right before bed. That would have been a very fun thing to do, but Theo was a bit too young for that and we basically went right from dinner to bed so we wouldn’t have had time. But with some older kids, and especially with an early dinner seating, that would be a fabulous way to wrap up the night. DD (1) loves showers so she wouldn’t mind, but still nice that Disney thinks about kids. Dinner at 8:15!! That is way too late for me and my kid. What time is first dinner? Nice idea to serve kids dinner first, keep them from being so antsy. I love that bib, clever idea. The first dinner is at 5:15, but I know a lot of families request that so I’ve heard it fills up early. The bib was awesome–I wish it came in a full body size :lol:. Woo hoo! Did you feel queasy on that rough day? We loved our cabin! 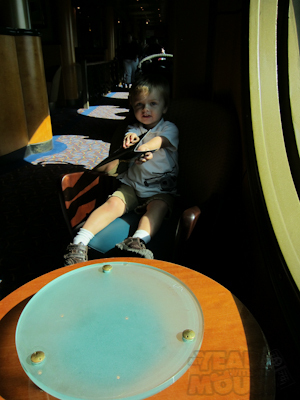 The little balcony was just fabulous and the whole stateroom was nice and spacious. And thanks for grabbing some magnets! Pingback: Trip Report Disneyland is still my preference.